Greek Food For Kids! -Greece Food Facts! 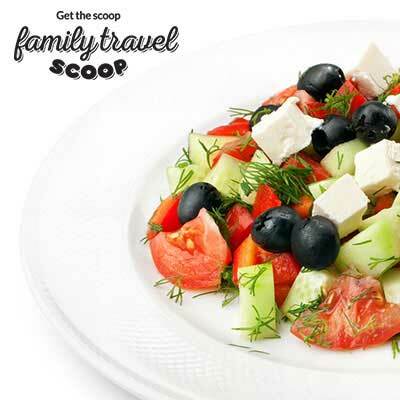 There are plenty of scrumptious Greek food for kids to sample on your family trip to Greece. Greek food is one of the famous Mediterranean Cuisines with influences from Italy and Turkey. Olive Oil is a staple as well as fresh herbs and fresh fruit and veg. Common ingredients are olives, feta cheese, eggplant, yogurt and honey. 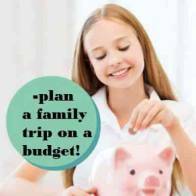 You will find lots of great food choices for your family. In the main tourist areas you will find the usual pizza and fast food restaurants but why not try the fast food of Greece - the gyros! Very delicious - most kids devour these! You can get great meals at the small tavernas around Greece and they are generally very child-friendly. Desserts are very tasty in Greece. Stop by a bakery for some fresh baked treats. 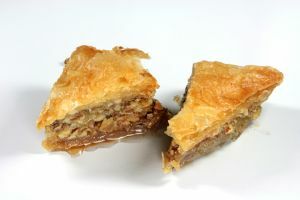 Many desserts are made with honey and nuts, as well as the flaky filo pastry. Baklava is a must try when you travel to Greece. This sticky sweet dessert is made from filo pastry, chopped nuts and honey. It is soooooooo yummy! I must admit we ate way to much of this stuff! My kids begged for it every time we passed a bakery. Greek Salad is a hit with the teenagers. Fresh tomatoes, cucumber, green peppers, red onions, feta cheese and olives. Topped with oregano and olive oil. My little one is a picky eater and wouldn't try it but my older daughter wanted this at every meal! Moussaka is like a Greek lasagna. Layers of eggplant, tomato and ground meat are topped with a white bechamel sauce and baked. Sometimes zucchini and potatoes are added. Children usually crave this dish! My whole family adored this - it is so good YUM! Tzatziki is the famous sauce of Greece. It is made from strained yogurt, cucumbers, garlic, olive oil, lemon, parsley and dill or mint. You will find this sauce served with many Greek dishes and sometimes as an appetizer with pita bread. Dolmades are stuffed grape leaves. The stuffing may be vegetables or meat or both. They can be served hot or cold and sometimes with a tomato sauce. These are a great snack for the kids and are healthy too! Calamari is a popular Greek dish consisting of battered deep fried squid. Lemon is often served on the side. Very popular and available in most tavernas! More Greek Food For Kids! Souvlaki is one of the tasty Greek food for kids. Small pieces of marinated meat (pork, lamb or chicken) are skewered and grilled. The meal can be served on a pita topped with vegetables and tzatziki or served on the skewer with a side of fried potatoes. This is a common fast food in Greece. Gryos are another tasty Greek fast food. Meat (usually pork or lamb) is roasted on a vertical spit. 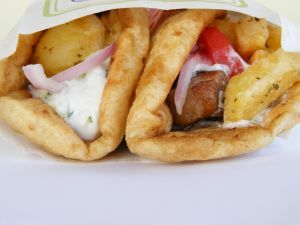 Slices of the meat are added to a pita and topped with tomato, onion tzatziki and sometimes fried potatoes. Delicious! Spanakopita is a warm spinach pie. Spinach, feta cheese, onion and egg are stuffed inside filo pastry. This tasty pie makes a great snack for the kids! Tiropita is a cheese pie similar to the Spanakopita. It is a flaky filo pastry stuffed with a cheese and egg mixture. Fassolatha is a hearty bean soup and is said to be the National dish of Greece. This flavorful soup filled with various beans, lentils, vegetables and tomatoes. Bougatsa makes a tasty breakfast for the family. Head to a bakery for a fresh baked batch in the mornings. It is a pastry filled with custard and topped with sugar. Another family favourite! Why do things with a million calories always taste so good? Tiganita are deep fried battered vegetables such as zucchini, eggplant or peppers. Can be served with tzatziki sauce for dipping. A great way to get the kids to eat their vegetables! Saganaki is a fried cheese dish topped with lemon and pepper. It is usually eaten with fresh bread. I liked this one more than the kids! Keftedes are Greek meatballs flavored with mint and oregano. One of the best Greek food for kids to eat while visiting Greece! Greek Yogurt & Honey makes a great breakfast for the kids. This fresh thick yogurt drizzled with sweet honey will be a hit with the kids. We tried this in Greece and it is now a family staple back home too! 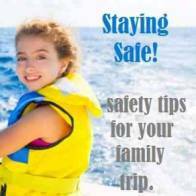 Are you visiting Greece with kids? 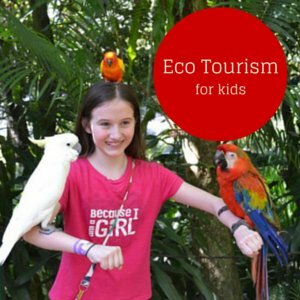 Check out these fun things to do in Athens with kids. 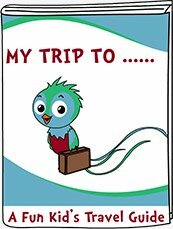 Or head to the beautiful island of Crete. 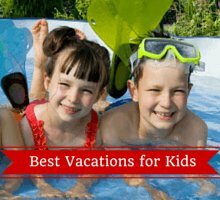 With picturesque villages, pretty beaches and lots of things to do in Crete with kids. Share your favoruite Greek Food for Kids on our Facebook page!